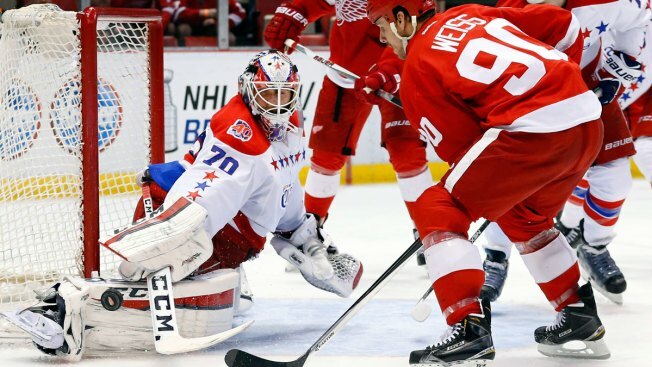 Washington Capitals goalie Braden Holtby (70) blocks a shot by Detroit Red Wings center Stephen Weiss (90) in the second period in Detroit Sunday. The Washington Capitals clinched a spot in the NHL playoffs Sunday with a 2-1 win over Detroit -- and with an overtime loss by the Ottawa Senators. The Caps are peaking as they close out the season, having gone 8-2-1 in their last 11 games, reported CSNWashington's Chuck Gormley. Stay with NBC Washington and News4 for more.